The F-35 Lightning II is still in the development phase, even as it’s being delivered to the field and readied for combat operations. As engineers, operators and maintainers discover issues with the aircraft, corrections and fixes are made to current and future aircraft. 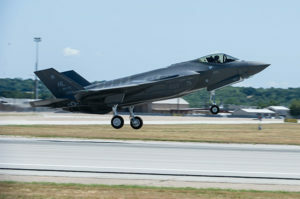 Concurrent testing and production of all models of the F-35 are per the plan laid out from the beginning of the program. The intent of concurrency is to get weapon systems to the warfighter as quickly as possible and strengthen manufacturing and supply chains. Air Force leaders recently made a decision to restrict pilots weighing less than 136 pounds from flying the F-35A Lightning II due to safety concerns about the ejection seat in a portion of the flight envelope. The manufacturer of the seat has been conducting tests to ensure the escape system works reliably and safely in all planned conditions. In a recent test, analysis identified an unacceptable risk of neck injury during parachute deployment/opening for lighter-weight pilots at low-speed conditions. The requirement is for the seat to be certified for any pilot weighing between 103 and 245 pounds. An unacceptable level of risk was discovered for pilots weighing less than 136 pounds. 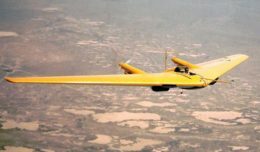 Air Force leaders decided that as an interim solution, no pilot less than 136 pounds will be allowed to fly the aircraft until the problem is resolved. As a result, one pilot was impacted. There is also an elevated level of risk for pilots between 136 and 165 pounds. While the probability of an ejection in this slow speed regime remains very low, estimated at one in 100,000 flight hours, the risk of a critical injury in that circumstance is currently higher than legacy fighter ejection seats. The Air Force has accepted risk of similar magnitude in previous ejection seats. Based on the remote probability of an event occurring requiring ejection from the aircraft and pilot weight considerations, the airworthiness authorities recommended and the Air Force has accepted continuation of flight for pilots falling within the 136 to 165 pound range. No ejection system is without risk. The Air Force continues to work with the F-35 Joint Program Office to ensure the F-35 system meets this requirement. Air Force headquarters and wing leadership took immediate action to inform and ensure the safety of the pilots, to address concerns, and ensure the manufacturer meets requirements for the seat. The F-35 is still in a development phase. As discoveries are made, fixes will occur, according to Air Force officials. 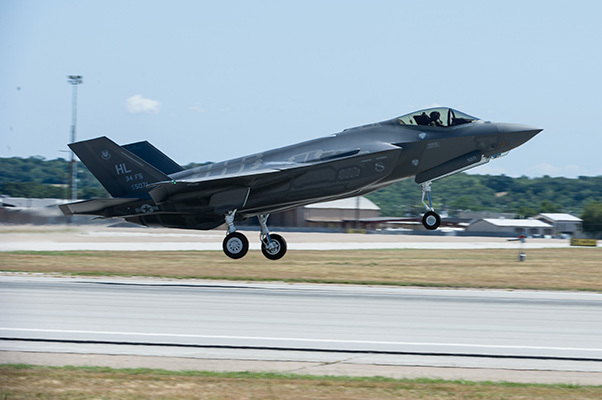 Concurrent testing and production of all models of the F-35 are per the plan laid out from the beginning of the program. The intent of concurrency is to get weapon systems to the war fighter as quickly as possible and strengthen manufacturing and supply chains. Several agencies are dedicated to solving the issue. The F-35 Joint Program Office is working in concert with the contractors to explore possible options to fix the ejection seat issue. The Air Force continues to work to identify any potential issues to ensure the best possible capability is delivered to the war fighter.